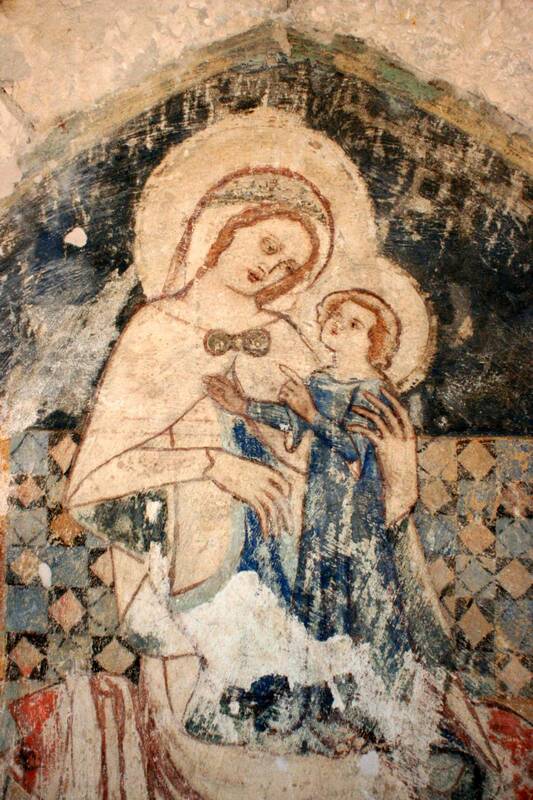 When the previously unknown fresco of the Virgin and Child was uncovered in the Inner City parish church of (Buda)Pest, the restorer and art historians alike were struck by the excellent preservation of large patches of azurite blue. The cloak of the Virgin and that of the Child is the same blue, and the background of the painting is painted with a darker shade of the same blue (azurite mixed with black). This find reminds us that during the Middle Ages, Hungary was one of the primary sources of azurite in Europe. The mineral (a copper-ore) came from the copper mines of northern Hungary, from places such as Rudabánya. It is well-known that ultramarine was the most expensive pigment in the Middle Ages - but it was very hard to get, and azurite was a good alternative. You can read about the pigment a lot, for example in Daniel V. Thompson's classic book on the Materials and Techniques of Medieval Painting. Paint samples have been analysed from the Budapest fresco, and beautiful microscopic photos of the pigment were made by restorer Éva Galambos - such as this one to the right. Hungarian azurite sources became generally unavailable to Europe after the Ottoman Turks occupied much of the country during the 16th century. There is a classic story, reported among others by Karel van Mander, that reminds us of these historical circumstances. Around 1558, Michiel Coxie was making a copy of the Ghent altarpiece of Jan and Hubert van Eyck (the panels of which are today in Berlin and Munich), for Philip II of Spain (also the Duke of Flanders). As Karel van Mander tells us, Coxie fulfilled this commission admirably. Coxie, however, was unable to obtain azurite of suitable quality - Coxie explains that this type of azure pigment, a natural coloring, comes from some mountains of Hungary, and was easier to obtain earlier, before the country came under Ottoman rule. Coxie in the end was able to get the needed azurite on the order of the king directly from Titian, who still had some. Van Mander goes on to emphasize that only the azurite needed for the cloak of the Virgin was worth 32 ducats. Did Jan van Eyck use Hungarian azurite, too? The sources do not reveal this - but maybe the new technical examination of the Ghent altarpiece will provide some answers. You can read van Mander's original text in the Het Schilder-boek, in the online edition of the Dutch Digital Library. The story is told in the Life of Jan and Hubert van Eyck.